The spirit, essence and history of Nakkertok are characterized by a strong tradition of, and commitment to, volunteering by present and past members of the club. In fact, the operation of the club and the services it provides to its members depends almost entirely upon the volunteer efforts of Nakkertok member volunteers. This has helped to build a strong sense of community and ownership among Nakkertok members. Are you a Nordic skier looking for a fun way to keep busy and fit next winter? Join the ski patrol for top quality first aid training then spend your winter on the trails helping out those who need it. It’s a great way to make your volunteer contribution. Training gets going in early September. If you’re interested or have questions, please send an email to jcepella@gmail.com OR info@gatineauskipatrol.ca. Nakkertok recognizes that for some adults / parents who do not have children in the racing program, it may not be possible to meet the required volunteer commitment. For this reason, we offer these adults / parents an opportunity to pay a fee in lieu of volunteer work. This option is not available, however, for parents with children in a racing program as these competitive teams require a great deal of volunteer support. During the registration process, Nakkertok members are asked to identify their broad areas of interest for volunteer work. Subsequently, they will be contacted by Nakkertok volunteer coordinators in those areas to discuss and formalize the specific volunteer tasks they will undertake. It is very important that all Nakkertok members honour their volunteer commitments as all Nakkertok members depend on it. Volunteer(s) of the Year – Individuals who, through their significant contribution of time and effort, have helped ensure that the Nakkertok season has been a successful one. New Volunteer(s) of the Year – First year members of Nakkertok who have quickly adopted Nakkertok’s spirit of voluntarism and have made a significant contribution to the success of the club in their first year as members. 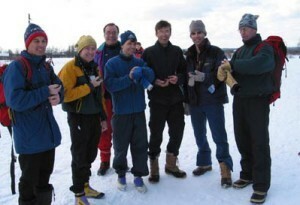 Golden Toque(s) – Long-time members of Nakkertok whose volunteer efforts over a decade or more have played a significant role in making the club the success that it is today. Please take a moment and see who has been recognized in the past to see the real power of volunteer work!